I am not an artist, the only thing I can draw perfectly is a stickman. And they have to be small, because I can’t draw a “big” straight line. However, it helped me a lot when I had to do some posters for school or to do some basic editing of photographs, as it is easier and quicker to work on. 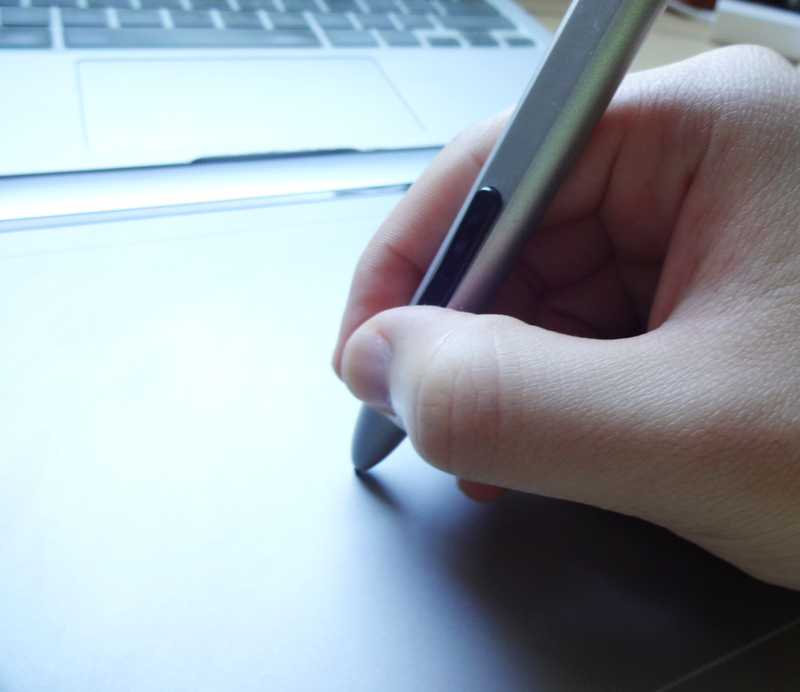 In order to use the tablet, you’ll have to install a software provided by Wacom in a CD. However, if you’re using a computer that does not have the CD driver, you can easily download the software in their website by selecting the product you have. This tablet is the medium size (there is a small version as well) and it is larger than the 11” laptop. Sometimes I think of it as almost a table, without the “t” at the end, given the large surface you have to work. 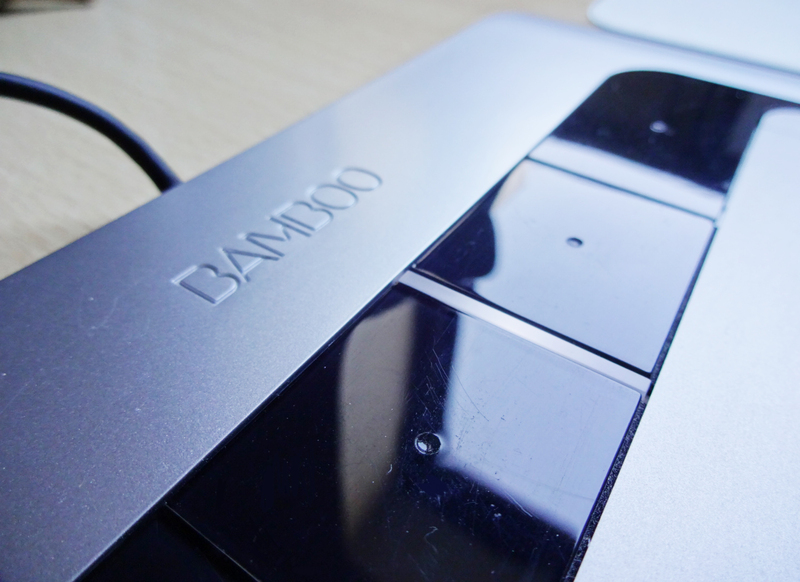 On one of the sides, you can see the word “Bamboo” beautifully engraved on the tablet. Right next to it, you’ll find 4 buttons with customisable functions. They can assume pretty much any role, from the key “Alt” to right click of the mouse or even other useful actions such as going back, forward or showing the desktop. The tablet fits both right or left handed people, it’s just a matter of choosing that option in the definitions (in the case of being right handed, these buttons will be on the left, as shown in the previous photographs). 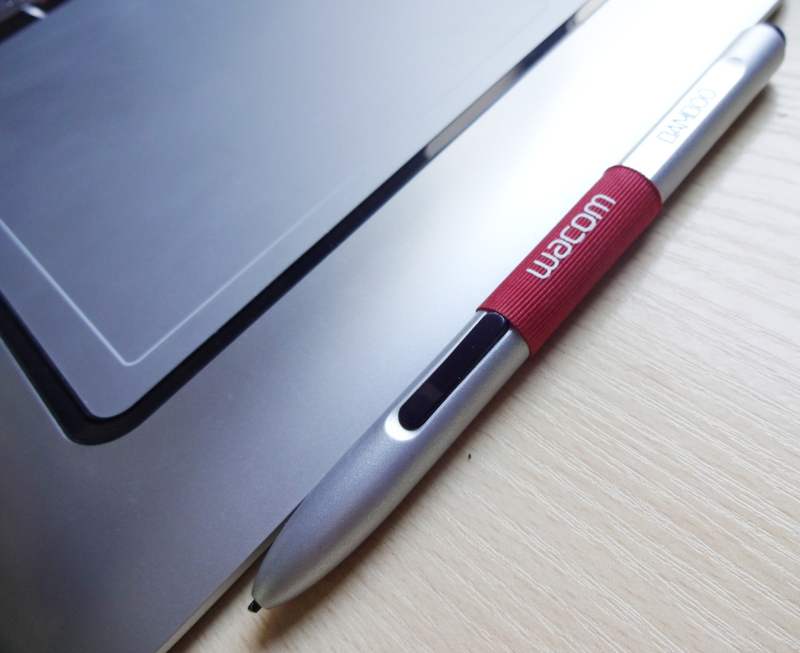 On the other side, there is a small piece of fabric with Wacom’s logo, where the pen fits perfectly. 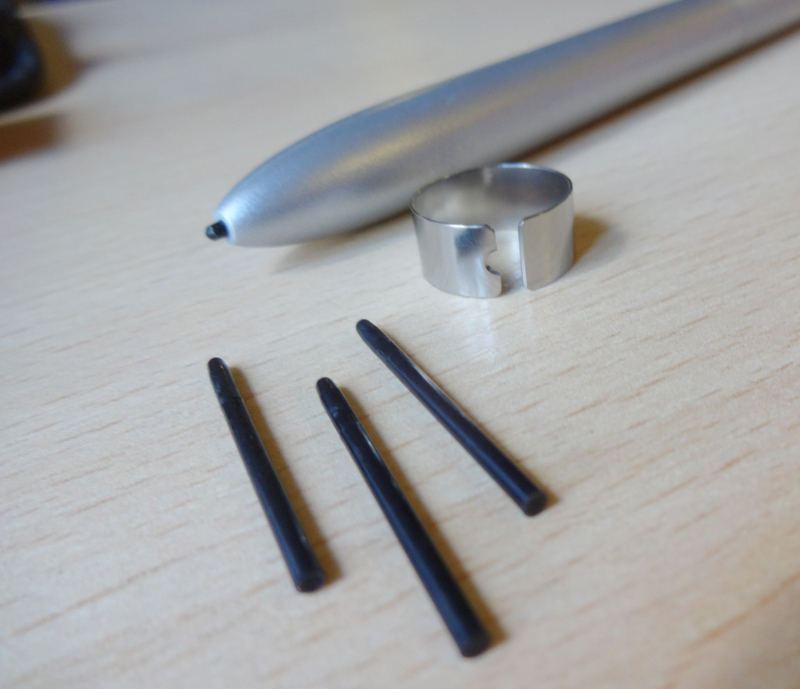 About the pen… With usage, the tip of the pen, which is made of some kind of plastic, gets smaller and smaller. This is not a problem, because you are provided with not only three more nibs, but also a tweezer that will help you change them. Replacing the tip is a very easy process. 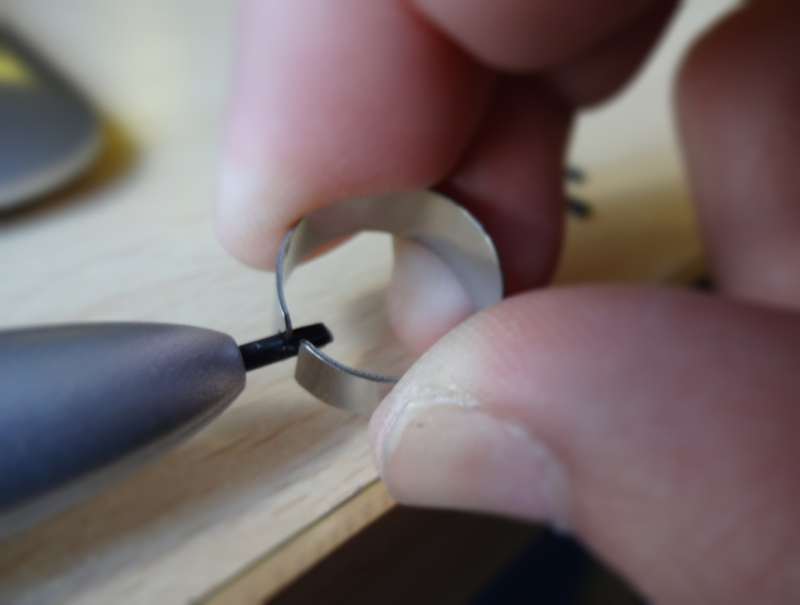 You only have to fit the semi-circle part of the tweezer in one side of the nib, press the tweezer and literally pull it out. To put a new one you just have to push it inside until it clicks. 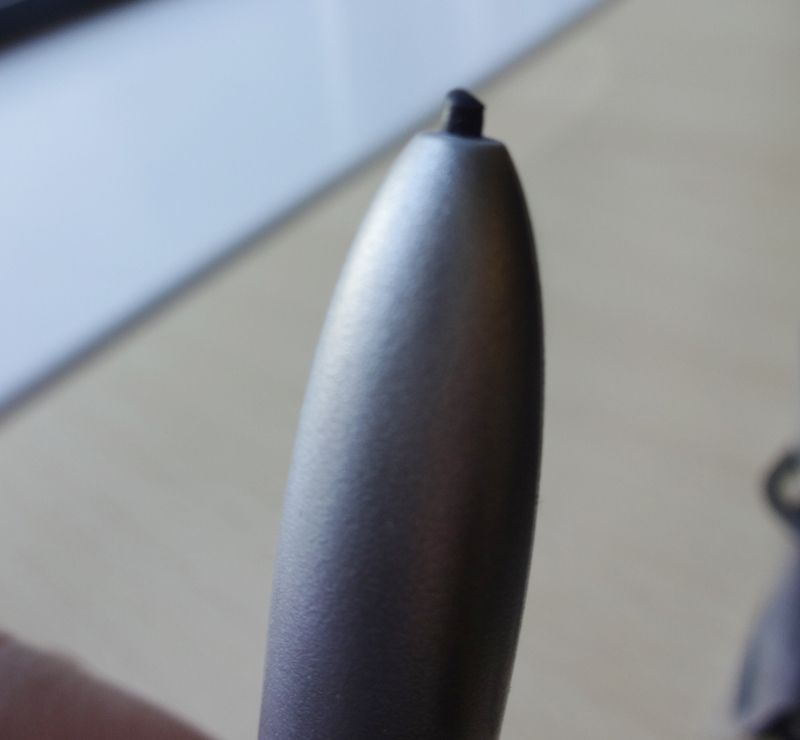 In case you run out of tips, you can find more replacing nibs in either Amazon or Wacom’s official website. 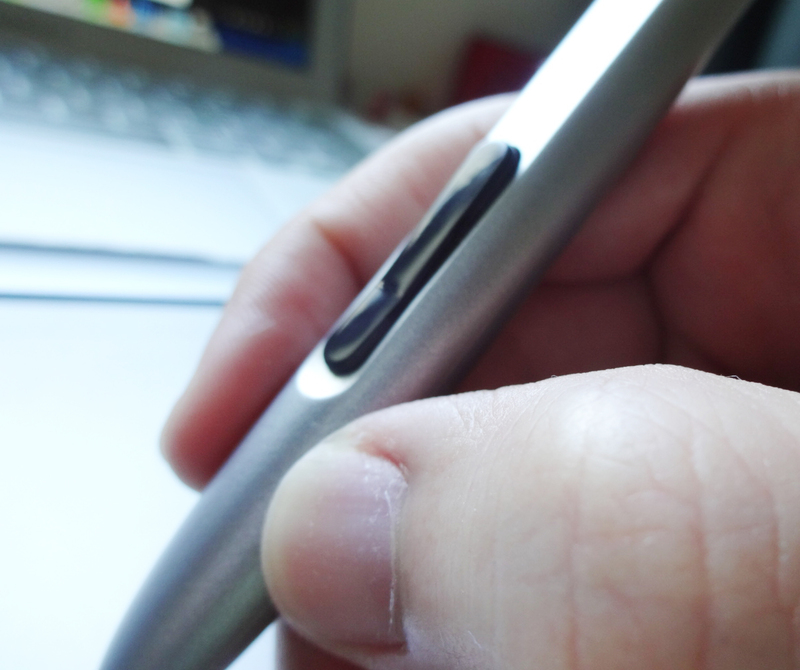 In the middle of the pen, just above where you’d hold it normally, there are two buttons, that are as customisable as the keys in the tablet, so they can have a large range of functions. The pen has also some other features to customise, like sensitivity, velocity and acceleration. I have to confess that I don’t know what these last ones mean, as I have never actually played with those options. Since I am not really trying to create art out of it (mostly because I can’t…), I am happy with the default options, I guess. On the top of the pen, there is another button. Like a pencil, this top part acts as a rubber in Photoshop, proving once again how quicker and easier it is to work in this tablet. 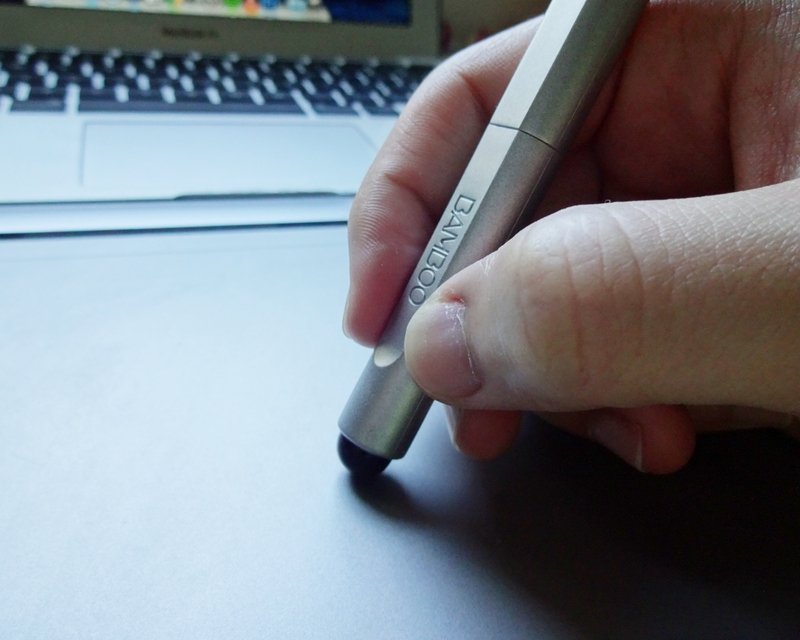 A great feature of the Bamboo is the sensitivity for pen pressure. Again, like any pencil, the harder you press on the paper, the larger is the line. It is exactly the same in this tablet, making the drawings a lot more realistic. 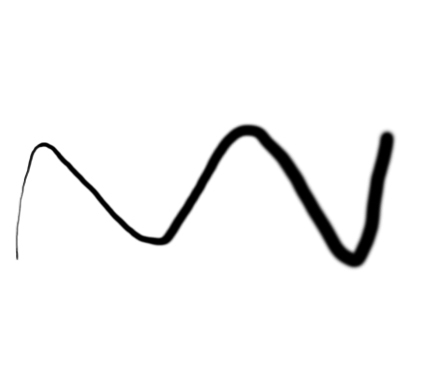 In this picture, for example, the pen wasn’t lifted up and the whole line was drawn with the same brush size. 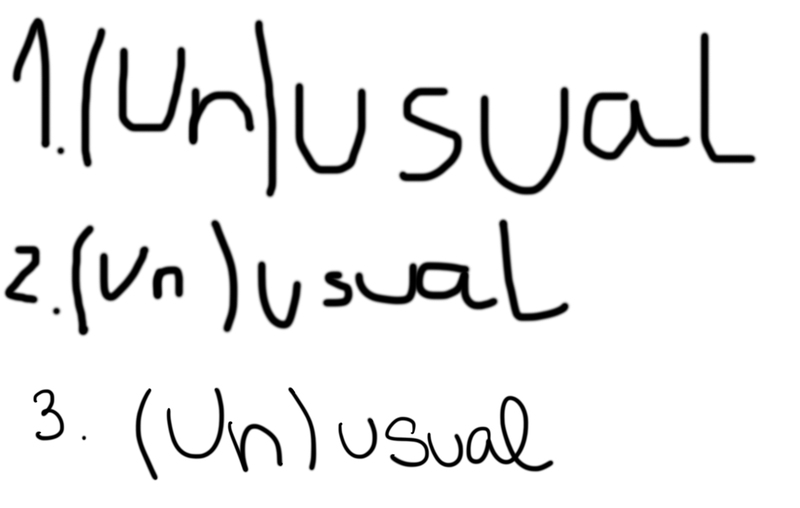 I believe it is obvious which one is the one I used the Bamboo tablet. The writing and the drawings are a lot more natural, good looking and realistic, otherwise the tablet wouldn’t be for much use, right? 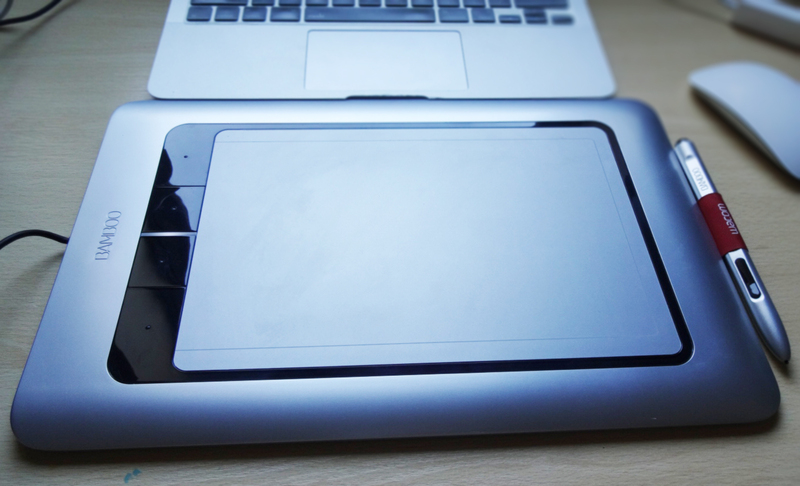 Between the trackpad (1) and the mouse (2) the difference isn’t too big, both look weird. Another characteristic of this tablet is that it is touch. 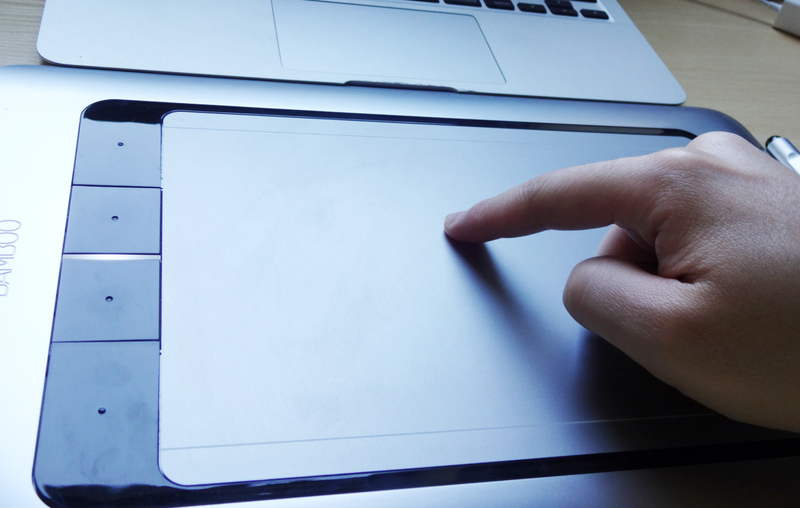 This means that it can be used as a trackpad too. Not only it is touch, it also has the multi-gesture feature, which enables you too zoom in and out, rotate, scroll, select text, just with the motion of your fingers. 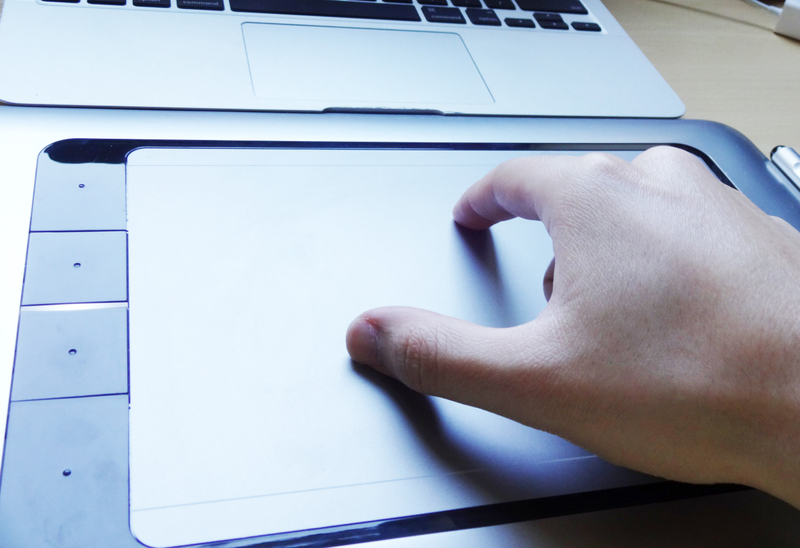 Pretty much like Apple’s trackpad. However, it is not as sensitive when compared to Apple’s products. Most of the times, I have to do the multi-gesture for several times until it does what I actually wanted. Furthermore, it feels like the mouse cursor is not flowing normally, but moving in small beats instead. The carrying case provided is very solid. I am a bit judgmental about carrying cases, because I like that my things are protected when I’m walking around with them. It gives me the feel that things are more portable. This fabric case has a leather (it’s not real leather, I think…) stripe with Bamboo written in the middle. 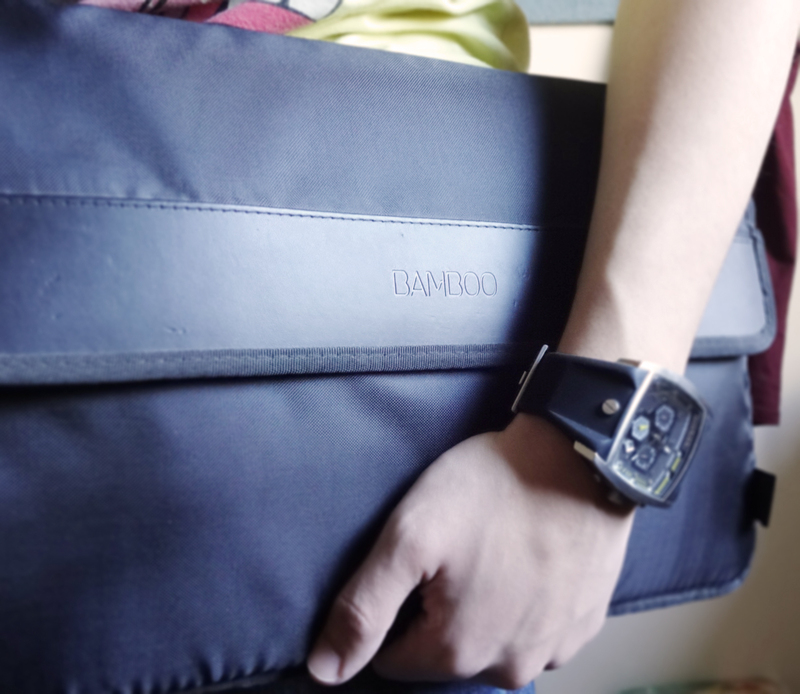 It is also very well padded, so I think the tablet will be protected against shock, to some extent, of course. I think that the Bamboo is suitable for most people. Artists will be able to create master pieces. Other people could use it to write up some notes in the computer, to ease a little bit the making of posters, or even as a trackpad. Update: I have just realised that this model might not be for sale anymore. There is a new version from Wacom, called Intuos and the medium size sells for £141,00 in Amazon UK. This entry was tagged Art, Bamboo, Drawing, Edition, Gadgets, iMac, Lifestyle, Macbook, Macbook Air, MacBook Pro, Multi-gesture, Pen, Photoshop, Review, Silver, Special, Stylus, Tablet, Technology, Trackpad, Wacom. Bookmark the permalink. It depends on the country you are in. 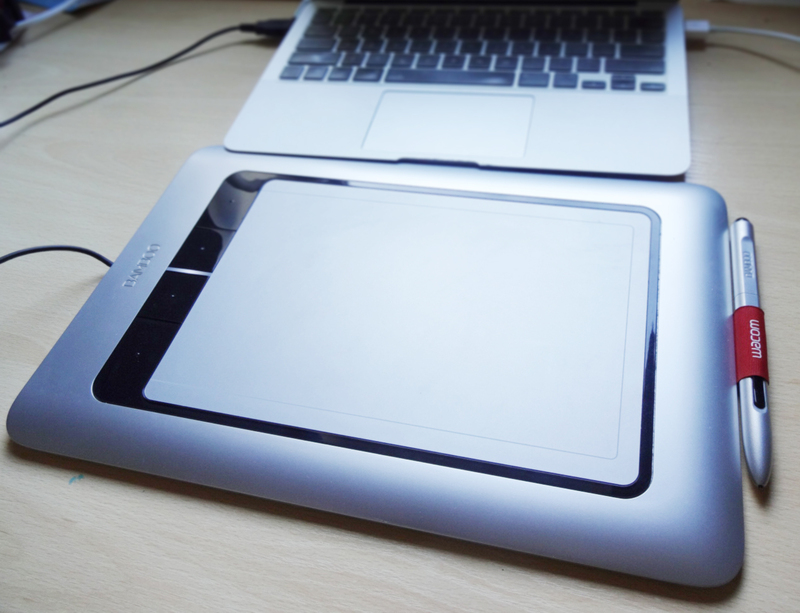 But I have just realised that this model might not be for sale anymore (I can’t remember for sure how much it was before…) There is a new version from Wacom, called Intuos and the medium size sells for £141,00 in Amazon UK. I will update the post! 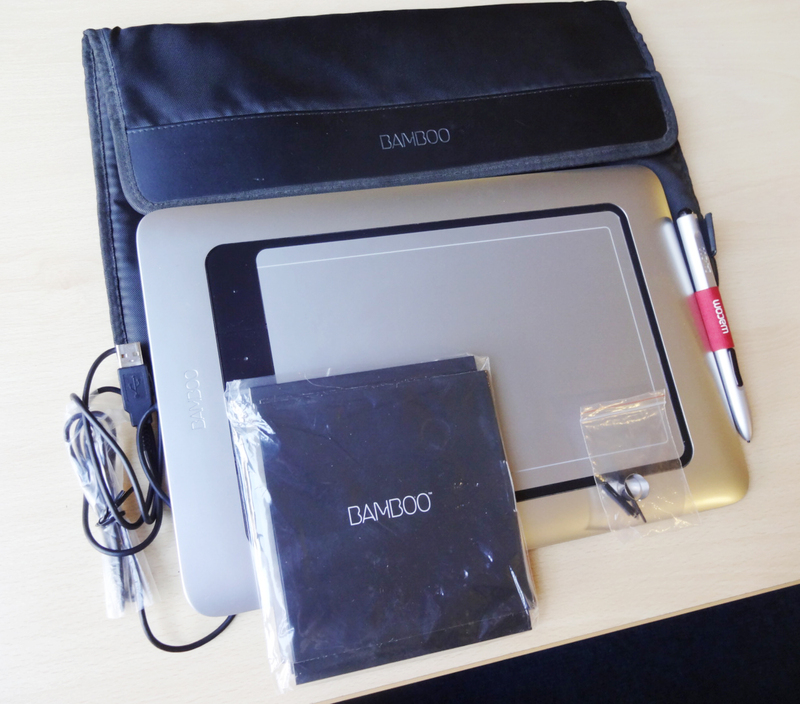 I have a Wacom Bamboo model CTL-470. 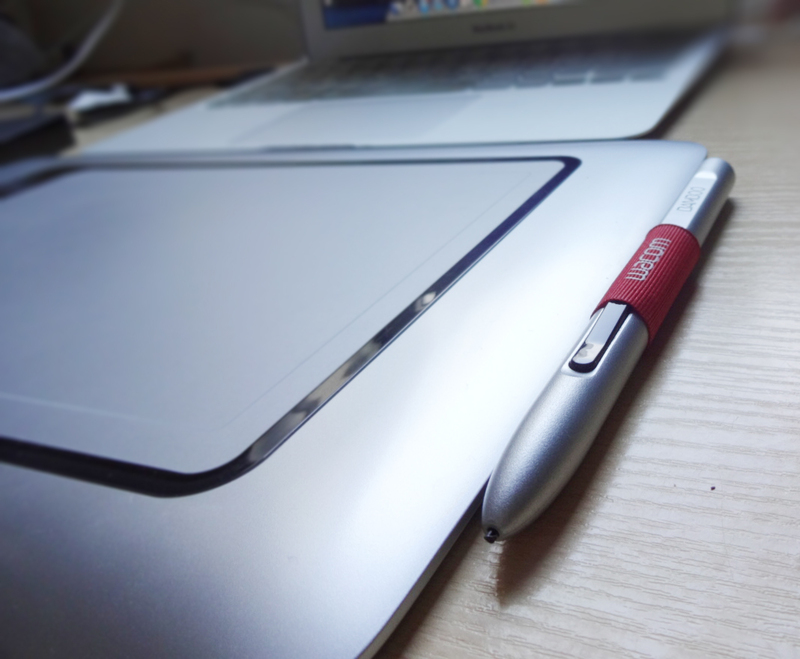 I bought it about 2 years ago and use it with Corel Painter and ArtRage. Though it doesn’t have all the bells and whistles as the model in your post, I have been very happy with the results I can achieve with it. I am pretty sure they are about the same in terms of quality and the results might be very similar. What do you do with it, mostly? Drawings and paintings? I used to do a lot of painting but in 2009, I began to develop tremors in my hands (an inherited condition). Because of the tremors, I shifted my focus to 3D art and used my paint programs and Bamboo pad as a quick sketch tool. Recently, a friend of mine suggested I should explore the incorporation of my tremors into my finished painting style. I believe that I’ll take her advice and give it a go. So it’s a good bet you’ll see more painting from me in the near future. That is actually a good idea, the one from one friend of yours. I think it would be an interesting project that may even turn out to be great! I wish you all the best and I’m looking forward to seeing more work from you. I’m honestly not sure why I enjoy your posts, inasmuch as I will never have any of these things … I think it must be because they are excellent reviews – clear, easy to follow, covering all aspects … just really good ! It means a lot to me that you find them easy to follow and complete – that is what I try to do, I don’t want to make the posts extensively boring. Thank you so much for the feedback! What a device! Just Wow! Are you sure this isn’t available anymore. I not, then do you know when will the new version be launched? I am not 100% sure, you might be able to find it somewhere, but in their official website I couldn’t find it anymore and in Amazon it was unavailable… However there is a new tablet called Intuos that might be pretty similar! I haven’t try it, but I’m assuming they will have the same quality as the other Wacom products. Thnx for the update. Will definitely check out the Intuos. You’re welcome! Let me know what you find and if you get the chance to try it, tell me how it is. Me too! It’s impressive how they can come up with so many good products. Yep! I have an old old OLLLLLLD bamboo that I prefer over anything else. I think after 3 years of owning it I’ve only had to change the tips twice. Oh 2 tips in 3 years is great! I haven’t changed the tip yet, but I guess I don’t use it as often. What do you mostly do with your Bamboo? Graphic design, drawing, writing, basically everything I can. I’ve been using my mouse more -lately- simply because I haven’t been working on much artsy stuff. I’m pretty much I’m using more the mouse as well, one of the reasons why I haven’t changed the tip yet, I think. But it really helps me editing the photographs, speeds up the process. I can’t imagine what I’d do with this, but it sure looks cool! I feel like I’m definitely not using it to its full extent, but it is quite fun to work on it and try to come up with random things to do. And yes, it does indeed look very cool! You’re welcome! I am glad you find it useful, after all, I am trying to help everybody making a well considered decision when they’re thinking about getting some new stuff. Thank you for stopping by to give me that nice feedback. This is truly one of the best technology have seen out there so far, Love it and I won’t mind getting one. Lovely pictures by the way. It really is incredible, the way it looks so realistic. You should indeed get one if you have the chance to and if you think it will be useful for you. Thank you so much for the kind words, it really means a lot to me! You should definitely grab one if you have the chance to! Thank you for stopping by!